Bob just got a new car and check out this radio! It’s bigger than my apartment! Love Little Steven’s Underground Garage, that’s worth the price of Sirius alone. Lot’s of clouds out today and that’s good news, it helps ward away that evil sunshine! I’ve looked at clouds from both sides now...oh wait a second, no I haven’t, I’ve only looked at them from this side. Never mind. And here we are, No Wake Zone, one of the best bars in Peoria, especially in the summertime. Can't beat the beer deck and the view here, we'll take a look at the view from here in a minute. First we need to walk the plank to get inside. Sundays are my favorite day/night to go out, but so many places are closed around here. It's nice to know there's places like No Wake Zone that are not only open, but the kitchen serves food till 9PM, no need to hurry on our pizza order today! It's still early in the afternoon, so there's plenty of seats at the bar. Super-cute bartender Stephanie cheerfully serves up two more beers. Love the Marilyn Monroe t-shirt she's wearing! The dining room's a little quiet now, but as I said, it's still early, it'll fill up later, it always does. Including 15% off pizza today! That's amore! Here we are on the deck that I talked about a few minutes ago. And here's that view I told you about, pretty fabulous, huh? Brittany and Jason were out here enjoying the view and it turns out that they're fans of the MBIP blog and are regular readers. They just moved here from Indiana a year ago and said that they're enjoying exploring around Peoria. It turns out that Brittany works with MBIP pal, Erik Reader at Group Peoria LISC. We all know what that means, time to cue this thing up. While Bob and I headed back to the bar for more beers. Fast forward a couple of hours and many beers later and it's pizza time! Here's Stephanie serving up a pie at the bar. This is a cheese pizza and it looks fantastic and generously topped with a lot of cheese. But we didn't stop there, this is our halfway week, so we had to sample more than just one pizza pie here at No Wake Zone, this one is a pepperoni pie. And here's a somewhat fuzzy shot of the third pizza, a sausage pie. After all the beers I've had so far, I'm just happy I"m remembering to take them. I'm kind of on automatic pilot at this point. Speaking of being on automatic pilot, I forgot to bring Tabasco from the Tabasco stand the Ragin' RR sent last week, so we have to settle for generic Frank's Red Hot Sauce. The good news is that I found out from Randall Emert on facecrack that I just left the Tabasco at Acme Saloon last week and didn't drive off with it on top of my car after all. So that's a good excuse to go back there! Brittany took a shot of Jason, Bob and I wolfing down the trifecta of pizza pies. And in the end, only eight squares remained for tomorrow's cold pizza challenge. Great pizza at No Wake Zone and now time for more beer! As night falls, Pete and Linda Clarno, the fun and hospitable owners of No Wake Zone show up at the halfway pizza party. Always great to see them! If you hang out in No Wake Zone long enough, you'll eventually run into 50's Diner owner, Scott Senti and sure enough, here he is with Pete and Linda! The party is in full swing now! Okay, by this time, my notes are a little garbled and I'm completely garbled, but I think this gentleman with Pete is John. Pete correct me in the comments if I need to update this, please! John bought a shot for the house and here's Scott and I downing it. After that it was time to stumble home. But I had to take one shot of the Stumpy Pete's House of Ham sign before I left, it's my favorite sign in the bar. I have to confess, I don't remember taking this photo, but I'm glad I did. Time for the next day cold pizza challenge. Cold pizza is good for a hangover, so I'm thankful for this today! We're down to two Kite Tails, I'm half tempted to open one of those up, but I have to work tonight, so that urge is resisted and I grabbed a tea instead. It's delicious! Thanks to Bob, Pete, Linda, Stephanie, Brittany, Jason, Scott and John for a great pizza party night at No Wake Zone. We'll see you all tomorrow! Three and a quarter Chef Boy Ar Dees—Great pizza and good times as always at No Wake Zone! Related Posts: YOP @: Farmington Pizza Company/Acme Saloon, Tobin’s Pizza, Joe’s Sports Grille, Broken Tree, Hoops Pub & Pizza, Oliver's Pizza & Pub North, Rizzi’s on State, Bacci Pizza, Veterans Pub and Pizza, Larry’s Driftwood Pizza, Norwood Pub ‘N’ Grub, Barrister’s Pizza and Pub, Mickie’s Pizzeria, Double A’s, Lucca Grill, Avanti’s, Leonardo’s, Lou’s La Grotto, Knuckles Pizza, Davis Bros. Pizza, Kenny’s Westside Pub, Dave’s Pizza, Peoria Pizza Works, Sugar and Agatucci’s. Took my heart to the limit, and this is where I stay. Black Roses New Record Is Out! We last saw The Black Roses on Record Store day at Younger Than Yesterday. 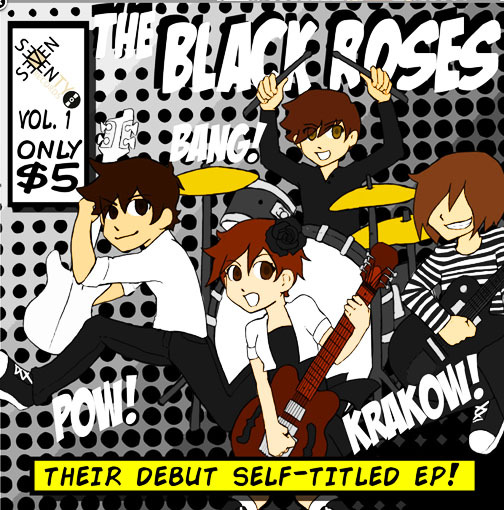 Last Saturday they had a party celebrating their new record release, “The Black Roses.” It’s a six song EP and if you missed the party like I idd (work got in the way, as always), you can purchase it right here. It’s available on traditional CD format and digital download too. it’s only five bucks and it’s filled with great tunes from Peoria’s best power pop band.